Before buying wheel chocks for your travel trailer, you should determine what to look for including its type, material and amount of support to provide. For this reason, we’ve created this buying guide highlighting the best RV wheel chocks and factors to look into for comparison. By choosing the right wheel chocks, we can increase the safety of our RV and our loved ones. 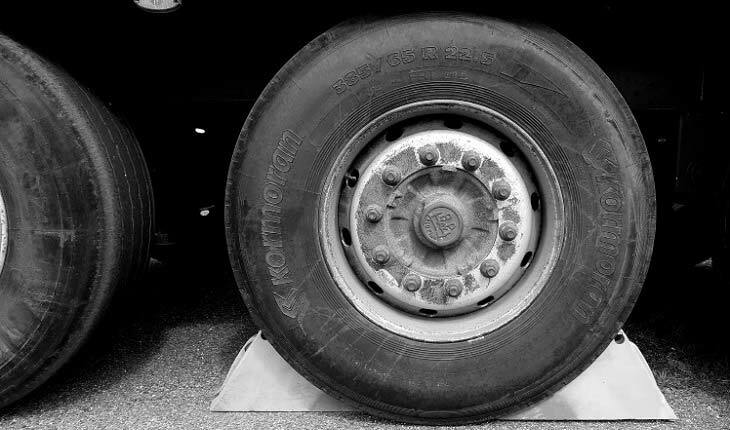 For example, these wheel stops can keep the wheels from rolling when you’re working under the recreational vehicle. And when you’re parked, you can also rest assured that the RV will stay in place and with reduced movement. To get started, let’s first review the best wheel chocks and later highlight the factors to consider along with answers to the most common questions. Prevent your wheels from rolling using these RV wheel chocks. I would like to recommend them their durability and solid performance. Just like when shopping around for any accessories or gears for our recreational vehicles, we would love to use those that we can rely on for a long time. 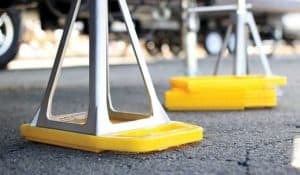 What makes the RV utility blocks is that they are designed to last and perform well versus when compared to other resin-made or plastic-made wheel chocks. More so, this product is built for all types of weather. It only means that they can work well under any weather conditions and that they won’t be ruined by a hot weather versus other cheaper products in the same category do. Another thing I liked about the wheel chocks is their rubber traction pad that keeps them in place. 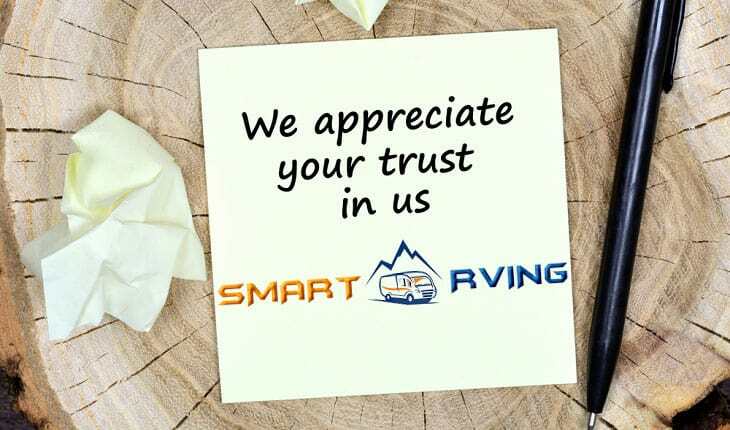 We can have peace of mind with a product like them because they also secure our trailer or recreational vehicle in place in all types of climate. When we’re parked, the last thing that we would want is to compromise our recreational vehicle’s safety. These wheel chocks can ensure that the wheels won’t be rolling. I also liked the size of the wheel stabilizer of 8″ x 4″ x 6″ (LWH), which are just the right dimensions not too big not too small. In addition, I’d like to recommend these chocks because they are designed with built-in handle that allows for easy placement. They’re also engineered with a rubber traction pad with an oil resistant surface for preventing slippage. More so, I noticed that the MaxxHaul wheel chocks are lightweight and durable at the same time to ensure our vehicle won’t be moving or rolling. On a downside, the wheel chocks have an unpleasant smell. 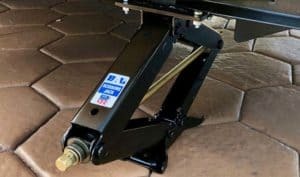 But overall, I’d recommend the wheel stabilizers if you want a compact, durable, lightweight and reliable accessory for your RV, camper, travel trailer or mobile home. I liked these Camco wheel chocks because they’re reliable and can perform excellently in all weather conditions. No matter your location, you can rest assured that you don’t have to worry about the chocks melting or being ruined. 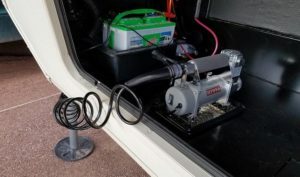 If you’re looking to keep the wheels in place and of course the RV, you might really want to take a look at the 44414, which is also one of the top-rated products in the category. I also noticed that the size of the RV wheel chocks is standard to fit almost all tire sizes of all cars, travel trailers, trucks and SUVs. With these wheel chocks, we don’t have to use that rubber, plastic or wood random wedges, which are too small for our RV tires. I don’t just trust these wedges for my recreational vehicle and cannot have peace of mind that they will do the job that they have to. I love that these wheel chocks can give us that confidence that they will fit the entire width of our tires. They have a larger surface area, which I believe is a great addition to the design. 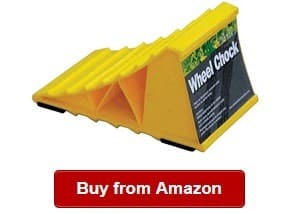 I’d like to note that the wheel chocks could be used on your vehicle while you’re working on them especially that you don’t want it to roll when it is lifted off the ground. Nevertheless, you can rely on the wheel chocks that can stand the test of time. And before I forget, they’re from Camco, one of the trusted brands in RV gears and accessories. You should definitely consider them if you want wheel stabilizers that can keep your camper in place. However, the wheel chocks’ plastic material might not be the most durable around and has no rope hole. But overall, I’d really recommend the travel trailer wheel chocks for its performance and versatility. This is a fantastic pair of X style wheel chocks! If you’re looking for an all-weather and dependable wheel stabilizers for your camper or travel trailer, you might want to take a second look at the wheel stabilizer. If you don’t want your tires to go rolling and prevent shifting, you should look for wheel chocks that can provide your vehicle with added stabilization and prevent tire shift through applying opposing force that can tandem with tire applications. One of the best things I liked about this pair is the design that makes it work so well when it comes to stabilization. The chocks can help in holding our vehicle in place while we’re making the changes. I also noticed that the difference in the design versus other wheel chocks is that they also perform well. One thing to say is that they can work with your tire’s natural movement, not against it. So when compared with other wheel chocks, the X-Chock Wheel Stabilizer 28012 are some of the best to use today. When shopping around for RV wheel chocks, we should also look for those that can work even in tight applications, and this pair won’t fail us. The X chocks can also be retracted down for up to 1 and 3/8 inches and extendable for up to 12 inches. As you see, they can be used in many sizes of tires, making them some of the most versatile chocks to use around. You will also appreciate the coating of the chocks, ensuring no corrosion and extended years of use. The X chocks can give you peace of mind that you’re getting more value of your money because they work great. I also liked that it comes with plated ratchet wrench that can turn a drive nut plus a comfort bumper in the purchase. The X-Chock is also lightweight at 11.2 lbs. On a bit of a downside, the x wheel stabilizers for camper are expensive. They can also be harder to install and remove than others are. Overall, I love the slimmer design and better efficiency of the x wheel chocks in terms of keeping the tires in place while we’re working on our recreational vehicle. Rubber chock blocks are some of the most durable wheel chocks for the recreational vehicle, camper, travel trailer, mobile home or truck. If you’re looking for top performing rubber chock blocks to work for many standard vehicle tire sizes, you might want to check out the Bunkerwall wheel chock blocks. One of the things that I liked about the industrial wheel chocks is that they come with a rope, which makes the BW3431 more useful than other models that do not come with it. By choosing the BW3431, you will also get a pair of heavy-duty chocks with ideal dimensions of 9.6 x 5.1 x 4.3 inches, that can fit most standard vehicle tires. Another thing I liked about the RV wheel chocks is that they are ideal for many types of vehicles, including auto, RV, truck and camper wheels. It is one of the things to ensure that we’re getting more of our spending on the wheel chocks. 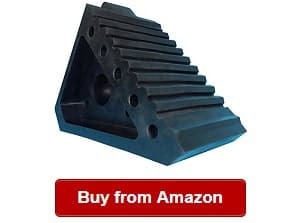 By choosing the BUNKERWALL wheel chocks for trailers, we can also be certain that we can use them for pairing with leveling blocks or levelers. You will also like the shape and design of the wheel chocks, which is an aircraft-style tire wedge shape. 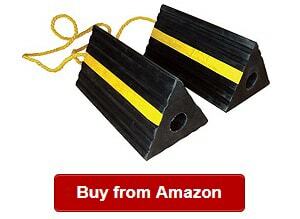 I also noticed that the wheel chocks are easy to pair and store with the durable rope included in the purchase. More so, the BUNKERWALL wheel chocks are designed with non-slip rubber surface that can help in maximizing the grip of both the ground and the tires. So if you want to prevent the tires from rolling while working on your vehicle, you can rely on this rubber chocks. And ensuring high visibility, they are also designed with reflective tape. More so, I liked that it can increase safety of the camper, camping trailer or caravan. On the downside, the wheel chocks have foul odor that might be lingering for a long time. The Trimax TCL65 is one of the best choices when it comes to chock locks on the market. One of the things I liked about the wheel chocks is that they can be attached to any wheel easily without any hassles. In addition, I’d like to recommend the TCL65 because they can prevent any wheel from driving or towing away. It has the universal design that can fit any sizes of wheels. With the chocks, you can keep the recreational vehicle secured in place. Using them, you can keep the wheels from rolling while they’re installed. Speaking of easy installation, the Trimax TCL65 is also easy to remove. You can use it without any difficulty for your camper, travel trailer, recreational vehicle or truck. When shopping around for chock locks, we should also find those that can offer flexibility, and that’s another reason I would like to recommend this set. It can also be used for boats and ATVs. So without even saying, it turns out that we’re also getting more value of our money when we choose the wheel chocks. You’ll also appreciate like the built-in chocks that can prevent any trailer rollaway, protecting and securing your valuable investment. In addition, I noticed that the wheel chocks are heavy-duty and come with pick resistant locking mechanism. It also comes with two keys, so you will have an extra in case you lose one of them. Finally, I liked that that chocks have a unique design, so they can stay in place to chock the tires and prevent them from rolling. On a negative, the rubber-coated arms are not that durable. But overall, the Trimax TCL65 is one of the top-rated products in the category that has the solid and compact features. 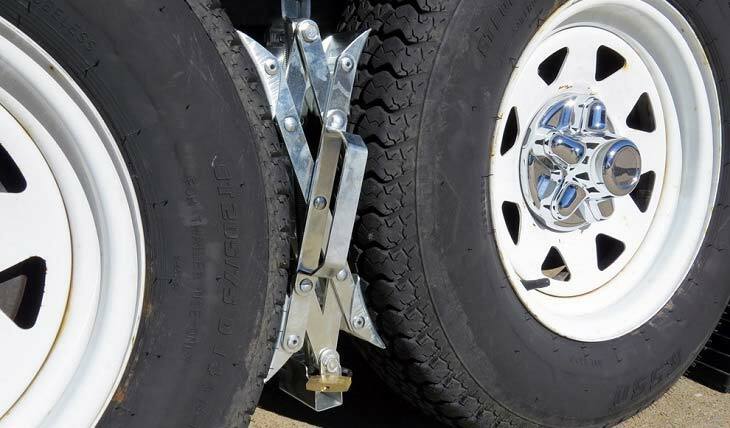 The travel trailer wheel chocks are heavy-duty, ensuring long-lasting use. You will not have to worry about its durability because it has a solid construction. 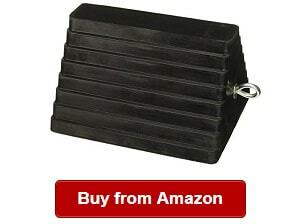 The 80681 is a solid rubber wheel chock that can ensure great grip. I addition, I liked that the 80681 is designed and built for all types of weather. In this case, we don’t have to worry about it being ruined by too high temperature. With that said, you don’t have to stress that it would crack, too. So if you’re shopping around for reliable wheel chocks, you might want to take a second look at the MaxxHaul 80681. It is also one of the top-rated products in the category, and I believe it also has to do with the high performance of the chocks that can prevent our trailer from rolling away. I noticed that they could offer a really nice grip that can keep our vehicle in place no matter the climate. More so, I found out that it has a non-slip surface that is also oil-resistant in providing excellent traction aside from having lightweight construction. The lightweight construction also makes sure that the wheel chocks can be used and attached easily versus some heavier x wheel stabilizers. 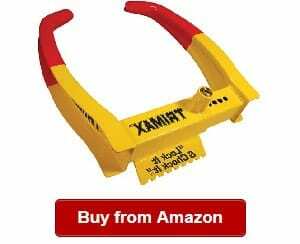 These Maxxtow wheel chocks are also long lasting enough, keeping any vehicle/trailer in place. The wheel chocks are also designed with eyebolt that makes attaching a chain easier. However, do note that you have to buy it separately because it is not included in the purchase. Nevertheless, the MaxxHaul 80681 is durable to provide a firm grip on all vehicle wheel sizes. They can also work on virtually all surfaces and are versatile for other applications due to the built-in steel eyebolt that makes it easy to attach a rope or chain for quick installation/removal. Finally, they can be used as aircraft and automotive chocks. On the downside, there were some reports of crushing of the wheel chocks. But then, those were isolated cases. There might have been some misuse involved because the product generally received positive ratings from its users. Another product not to miss when comparing your options for RV tire locking chocks is the Fasmov wheel chock. It has the performance and heavy-duty features that make it to this list of the best wheel stabilizers on the market now. One thing I appreciate about the wheel chocks is their solid rubber construction, meaning they can last long for years of service. By choosing the Fasmov chock lock, you can have peace of mind that you are getting more value of your money. In addition, the wheel chocks are durable and reliable to perform on all types of weather. It only means that you can also rely on it even if you are living in a hot climate area. One of the things I would like to note is that the product is heavy-duty that it can deal with the changing weather and pressure to receive. The product also has an ideal size of 6.4 x 3.5 x 3.8 inches (LWH). It can be used in all tire sizes, which is one of the most important for its flexibility. The Fasmov Solid Rubber Wheel Chock has a solid rubber construction that makes it an ideal choice for RV owners looking for wheel chocks to provide firm grip on the tires. The surface is oil-resistant that can give you peace of mind that your RV won’t be rolling away. If you’re working on your vehicle, you can rely on the camper wheel chocks because they also have a durable ribbed construction. The wheel chocks are also providing a firm grip on all surfaces. They can be used for travel trailers, trucks, boats and other vehicles aside from the recreational vehicle. You can also re-hitch with confidence using the wheel chocks, so they’re really reliable on the road. On the downside, the smell can be annoying. Overall, the wheel chocks are reliable and heavy-duty to last for years. If you’re shopping around for best rated RV wheel chocks for the travel trailer, camper, mobile home, truck and recreational vehicle, you should not miss the Supreme Wheel Chock in the selection process. 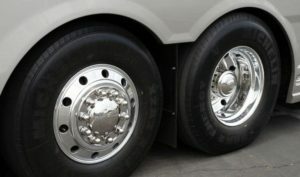 The two-pack product should be considered if you’re looking for cost-effective and reliable wheel stabilizers, which you can use for applications that also include when working with your RV, preventing the tires from rolling and using with lifting devices or ramps. I noticed the wheel chocks are effective for their firm grip to keep the recreational vehicle in place so that it won’t roll away. You can just imagine the danger to happen if the vehicle would be rolling away, and we should not let that take place. If you’re looking for a reliable wheel stabilizer that can secure the camper or vehicle in place, you should not miss the Supreme wheel chock pack of two in the comparison process. I’d also like to note the design of the recreational vehicle with the black foam strips, which can prevent the stabilizers from slipping. With it, you don’t have to worry about your recreational vehicle rolling away while you’re working on it. One more thing you can notice with the wheel chocks is that they are lightweight. They are easy to install and remove unlike other wheel chocks on the market are. In short, you will not have a hard time in using the product in your mobile home or boat. I also liked the curved surface of the Supreme wheel chocks that can offer us with an easy placement into our wheels. You will appreciate that it will not give you a hard time to use the stabilizers because they have a cool design not to find in other models. On a negative, the wheel chocks are not the most durable around. The 21-001095 Super Grip chocks is by a top-class manufacturer of high quality and dependable products. Through the years, they’ve been committed to offering only cost-effective and durable wheel chocks to their customers looking for not only affordable but also long lasting accessories and gears for their recreational vehicle. For a stable and secure trailer, you might want to take a look at the 21-001095 because they work so well in positively keep the wheels in place. You can move around your travel trailer, truck or camper without any worries by using the Ultra Fab chocks. I’d also like to note that the Super Grip chock is very dependable when it comes to securing our vehicle in place. The good design is able to do that, and I think that it is even better than those of other wheel chocks on the market are right now. I noticed that the design would be able to keep no wheel movement no matter what we’re doing or working on even if we’re getting p in the middle of the night, drinking coffee and doing other things. We can have the peace of mind that the trailer will stay in place. Using these wheel chocks, I believe that there can be better traction and the elimination of front-to-back rocking motion. I also liked that the stabilizers can collapse for up 3.5 inches and expand to 17 inches, making it suitable for many tire sizes. On a negative note, those who are unfamiliar with this design might find it hard to install and remove them. But overall, I think the design is superior for ensuring no rocking movement of the trailer. I’d also like to recommend the wheel stabilizers if you have a larger vehicle to secure in place. They might be better than blocks in this case. Are you looking for the highest amount of security and stability for your trailer? 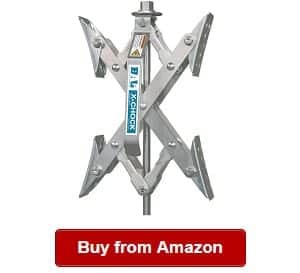 One of the best wheel chocks on the market is definitely the Fastway product that can be used ideally for travel trailers, campers and recreational vehicles for its long length of 16-24 inches axles. I also liked that the product also comes as a two-pack option that works in tandem for our vehicle, even for the larger ones. 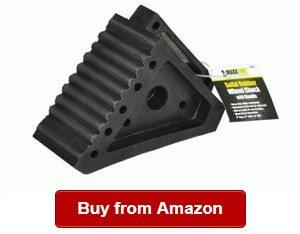 I would like to recommend the chocks because they’re easy to use without kneeling down, yet they offer much security. I also believe that these wheel chocks are some of the best in terms of providing the highest level of stability and security. They work so well when it to keeping the wheels in place so that we can move around without worries. There will be no wheel movement at all when you choose the RV wheel chocks. With them, we can do whatever we have to do, while being sure our vehicle won’t move forth and back when we’re parked. Using the camper wheel chocks, we don’t have to look for rocks or wood when we got to the campsite or wherever we are. It can be too frustrating to look for wood chunks all the time if we have the recreational vehicle wheel chocks that can keep our camper or travel trailer in place. 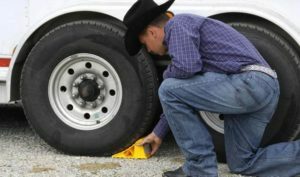 I’d like to recommend the ONEstep chock because it is also ideal for most types of vehicles, including cargo, fifth wheels, horse farm, travel trailers and utility trailers. You can depend on the recreational vehicle if you’re finding wheel chocks to use for those mentioned application. With more versatility, we can be certain that we’re getting more of our spending. The model is also very easy to install into place. You can quickly lock, place or remove the chocks even when you’re standing. When you choose the recreational vehicle wheel chocks, you can ensure that you don’t have to do ratcheting that can be tedious to do from time to time. The one-step chocks can also offer us with a custom size that will be able to help us in selecting the best type to fit our trailers. On a downside, the product might need a little getting used to if you’re unfamiliar with the design. Overall, the wheel stabilizers are what you need for a stable and secure RV that won’t move out of place when parked or you’re working on it. When shopping around for a rubber wheel chock, you should find one that has added durability in style. The YM W4194 is one of the best I found in this regard because it is made of reinforced rubber offering a secure and tight grip on the tires. And due to that, we can have peace of mind that our RV or trailer will stay in place when we choose the YM W4194. One of the things I liked about the wheel chocks can also resist ozone weathering, abrasion and tearing. So if you’re searching for a long lasting and durable wheel chocks for the recreational vehicle, you might want to take a look at the YM W4194 that can keep up with heavy abuse and use and can withstand pressure. In addition, you can have peace of mind that you won’t have a hard time when it comes to placing them on the tires because they offer easy installation and removal. With them, we don’t also need to use homemade RV wheel chocks that might not work well in securing or keeping our recreational vehicle in place. You don’t also have to look for rock and wood pieces when you reached the camping site because you have the ready-to-use RV chocks that you can use easily and quickly in times you need it. With them, you don’t also have to stress about your vehicle moving when parked or you’re working on it. So even if you’re cooking or preparing coffee, you can have peace of mind that your RV will stay in place. On the downside, they can have this strong rubber smell that can be annoying for weeks. However, it eventually subsides when left outside for weeks. Overall, they’re reliable and durable to work for the years to come. They won’t easily crush or melt even with the hot weather, too. The tandem wheel locks are a pair of durable and efficient chocks that have a great design to ensure that they would grip the RV tires well to keep them in place. Using the 70074 wheel chocks, you don’t need to worry about your vehicle rolling or moving when it is parked. So if you’re working on the recreational vehicle, preparing food or simply doing other things, you can rest assured that your camper or travel trailer will stay in place. The best wheel chocks for RV are also designed to perform with a scissor action that works effectively in locking the tandem wheels, preventing them from moving front to back. These locks can also prevent theft, so they’re truly reliable when it comes to keeping your precious investment secure. 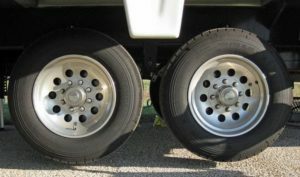 You can also rely on the wheel stabilizers that can provide a firm grip to your RV tires so that the wheels can work against each other in order to stop or reduce any motion. This set is also ideal for most tire sizes because each can collapse up to 16 inches and extend from 1 and ½ inches to six inches. The MaxxHaul Towing Products 70074 has a heavy-duty steel construction, which is also corrosion-resistant, ensuring that it will last long. The locks can also be used for motor homes, wheel trailers and campers. On a downside, the wheel locks require buying a separate padlock, but nevertheless, it is one of the most durable products in the category that you can rely on. 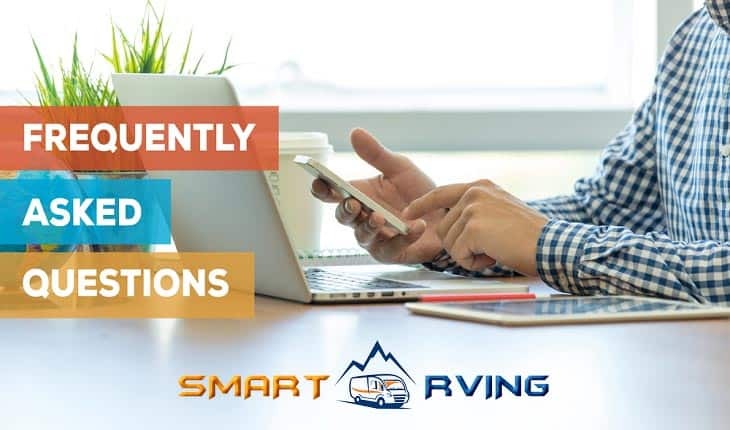 The reviewers of Smart RVing are seasoned RVers who have combined years of experience in RV camping and outdoor adventures with our fifth wheels and travel trailers. Through the years, we’ve used different recreational vehicle appliances, accessories, gears, systems and other things that our vehicles need. And with that, we’ve also used different brands and their products. From those firsthand experiences using the RV gears we have determined what features to look for when finding specific items. Those things to consider are what we used to determine the best picks in the category. From those, we’ve researched the best wheel chocks and reviewed each of them to help you find the right wheel chocks. Wheel chocks are simple yet useful additions to your recreational vehicle because they’re important in keeping it secure in place. Every trailer or truck should have it so that it can prevent from rolling away when parked or you’re working on your RV. Basically, these chocks are wedges put under the tires to keep the trailer, camper, 5th wheel or truck in place. Without even saying, the chocks are safety items to have if you have an RV. We can use it anytime that we park our trailer and prevent it from moving especially if the road has an incline on it. The chocks can prevent the wheels from front and back movement. Such can also be lifesavers as when we need to work under our camper. How does it work? It works to prevent our wheel from rolling. These wheel chocks can provide our trailer a ramp that the wheels have to go up if they want to continue revolving but they cannot. So with wheel chocks, the wheels will not revolve or roll, keeping our RV safe and us too. Now, you’re probably asking what types of wheel chocks for trailers are. Check them out in the following. First, there are wheel chocks, which are wedges that have traction pad, of either foam or rubber. Some of them can be used on wheel with up to 26 inches in diameter and some up to 29 inches. 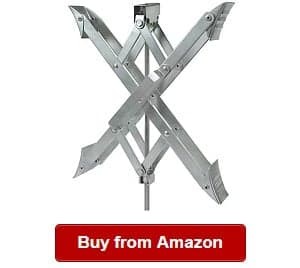 In addition, some of them are also available with rope add-on to make the chocks easier to position and remove from underneath without you kneeling. Many of them are also made of durable and hard plastic material, containing UV inhibitors so that they can last long. You can also select x chock wheel stabilizers. They’re the other type of wheel chocks, which can fit between tandem tires. They work through applying an opposing force to prevent the movement of the tires. These chocks are also adjustable that they can accommodate widths, which vary between tires. The wheel stops can also retract down 1 and 3/8 inches and can expand to 10 inches, ensuring you can adjust it to make it tight and secure as possible. However, these wheel stops are more expensive than the plastic wedge types are. On the other hand, there are also wheel stops designed and made for small/large tire spacing. Usually, these are made of plastic materials so they are easy to bring anywhere. The wheel stabilizers also have adjustable width, but they are more affordable. There you have the types of the RV wheel chocks to choose from and use depending on the size, weight and type of your trailer. 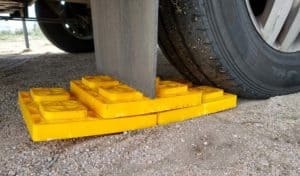 You need an RV wheel chock to ensure that you’re RV won’t be rolling when you have parked it or when working under it. These items can also provide challenge to the wheel. The chocks are presenting the wheels an uphill that can stop it from revolving, keeping them in place. On the other hand, if yours is a tandem axel trailer, you want to ensure that both sets of wheels are locked in place. These products can also specify the weight that they can accommodate. It is one of the reasons you should check that the chock could hold the trailer’s weight. You should also determine the kind of materials these chocks are made of in addition to the grip. Thus, you should find the one that can fit the camper or trailer. Chocking the wheels using these items is an important security measure, so you should not forget to have them before leaving. You should also ensure that you put the chocks in front on the tire in the place where the incline is located. But to ensure that the tires won’t really move or reduce motion, you should use wheel stops or chocks on both sides of the trailer. Tandem wheel chocks or wheel chocks are important items for the recreational vehicle, travel trailer, camper or truck because they can keep the wheels from rolling. They are small but essential items to have, so you should be extra careful when choosing these RV safety accessories. If you’re looking to buy the right pair or a few sets of them, check out the following things to remember. You should look for wheel chocks that do not fail easily or crush because they’re safety items in the first place. By choosing the wrong wheel chocks, you might be in trouble. 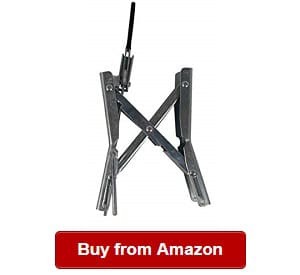 So before buying, you should determine the material of the chocks. You should check what they are made of to ensure that they are made of heavy-duty materials. Being durable, it also means that you can have peace of mind that they won’t be ruined easily when exposed to nasty weather. There were a few reports that some of the chocks have the tendency to be crushed or ruined. However, in some of these cases, they did not select the right type of chocks for the weight and size of their trailer. It is also one of the reasons that choosing the appropriate type for the camper wheel chocks is essential because it can increase the chance of a longer-term use. Nevertheless, you should also check for reviews to find RV wheel chocks that can work under harsh conditions and that won’t rust, crumble or break easily. So if they’re accidentally rolled over on, they can still work well. On the other hand, if you’re going for wheel stops or x chocks, choose those made of all steel construction with antirust coating or lining. If you’re selecting traditional wheel chocks, you can go for those made of thick plastic or rubber that won’t chip off easily. Do you need added features? When choosing wheel chocks, you should also determine if you want those with cords or handles that will allow for easy pulling. Do you need one that has a visible color to stand out? If choosing an x-chock, does it include a wrench? Are the wheel chocks with a reflective tape? These are some of the features to look into when buying new wheel chocks. Determine what else you want your wheel stops to have. Do not go for those that are complicated to install and use. You should go for those that any family member can install without any hassles. Start with the selection process using our list earlier. What’s the size of the recreational vehicle or travel trailer you’d be using the chocks? Don’t just buy any wheel chocks for your recreational vehicle. Or else, you might be one of those who ended up with too small or too large chocks for their needs. So to check on this, you should find out what can the wheel stops can support. On the market, you can find a wide range of sizes for these wheel chocks. While some of them are small, they can also support big size of trailers. On the other hand, if you’re using tandem wheels, then you might want x-chocks. However, you should first determine the space between your tires. More so, you should know if the x chock can fit in that space and can offer maximum support. There are also tandem wheels, which can be as close as two inches or as far as 12 inches. So when selecting, you should also get those that can match the distance you need. What’s the strength of the grip? 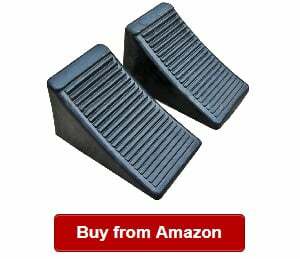 It is an important consideration when choosing the RV wheel chocks for your vehicle. The better the grip the more peace of mind you will get because it means it is safer to use. You should also look at the ribbings of the wheel chock and find out how much suction power its rubber can offer both for rough or smooth roads. What’s the max allowable Gross Vehicle Weight Requirement it can accommodate? This is important to ensure that your chocks won’t break. 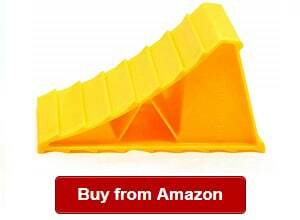 When buying this product, you should check that it could handle the load of the recreational vehicle. These items, particularly the x-chocks, have specifics on this one. Check it and find out if it can handle the weight of your vehicle to prevent it from breaking. What kind of stabilization can it provide? Another important thing to figure out when choosing wheel chocks is the amount of stabilization it can supply especially among x-chocks or tire lockers. When choosing one, you should find out if it could minimize the movement – rolling or rocking forth and back of the tires. With one that has high amount of stabilization to offer, you can protect your rig’s wheel suspension. You should check on this feature when making a comparison. Get started with the selection with the products we’ve featured here. A: Wheel chocks are needed especially when parking on a road with an incline. If not, the recreational vehicle might roll away. These wheel chocks can prevent damage to the property, accidents and injury, so they’re always necessary to have onboard. While you can make homemade one, they cannot ensure safety. Q: What are good RV wheel chock brands? A: We’ve found cool brands of these wheel chocks on the market. A few of them include MaxxHaul, Camco, BAL R.V. Products Group, BUNKERWALL, Trimax, Fasmov, Supreme, Ultra-Fab Products, Fastway and, YM. Q: What are RV wheel chocks made of? A: Wheel chocks are made of different materials depending on the brand and model. Some of them are made of an all-steel construction while others are made of plastic. You can get started comparing your options on the different materials wheel chocks are made of using our reviews earlier. Q: How long does an RV wheel chock last? A: There is no definite answer on this one. It depends on usage, material and other factors. For example, misusing the chocks can crush or break them, such as if you’re using too small chocks for large tires. Q: How many wheel chocks do I need? What size? A: It will depend on the wheel chock types you’re going to use. So if you’re choosing x-chocks, you’ll need one pair in order to balance both sides of the vehicle. Then, you might also need supplementary chocks to prevent the wheels from rolling while installing the x-chocks. And for this, you will need at least one pair of traditional wheel chocks. Q: How to properly use RV wheel chocks? 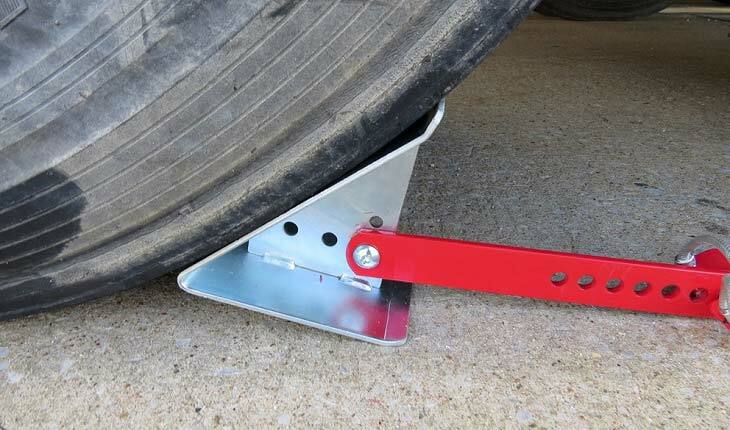 A: They’re simple and easy on how to chock wheels on a trailer. If using traditional chocks, you can just place them properly against the tires. For some, you just have to back your vehicle up towards it until your tires stop. But for the x-chocks, you should install it between the tandem wheels. Q: How to use RV wheel stabilizer? A: You can use the x-chock wheel stabilizer that you can install them between the tandem wheels. You should just adjust it so that it will snugly rest between the two tires correctly. Q: Where to place RV wheel chocks? A: It is very easy to use wheel chocks that you just have to install them based on the type of wheel chocks you’re using. You also place the wheel chocks in front of the tires where the incline is located to prevent them from rolling. Q: How to make RV wheel chocks? A: The size of the wheel chocks to make depend on the size of the RV wheels, but usually, it should be 25% of the wheel size. If using wood, you should add rubber pads on its surface underneath for traction and friction creation for a more stable wheel. I also found cool tutorial videos on YouTube on how to create homemade wheel chocks. 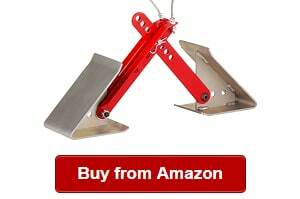 A: There are many places to buy large or small wheel chocks as well as x-chocks. You can buy them in stores or online, such as on Amazon where to find a wide range of selection with varying brands, models and types. There you have what to know about the best RV wheel chocks to choose from and use for your trailer. Based on the factors discussed, choose the right wheel chocks to provide ample support and stabilization for your vehicle to keep it from moving or rolling away. Finally, compare your choices well and determine the right one that can suit your needs and right for your vehicle’s weight and tire size today!